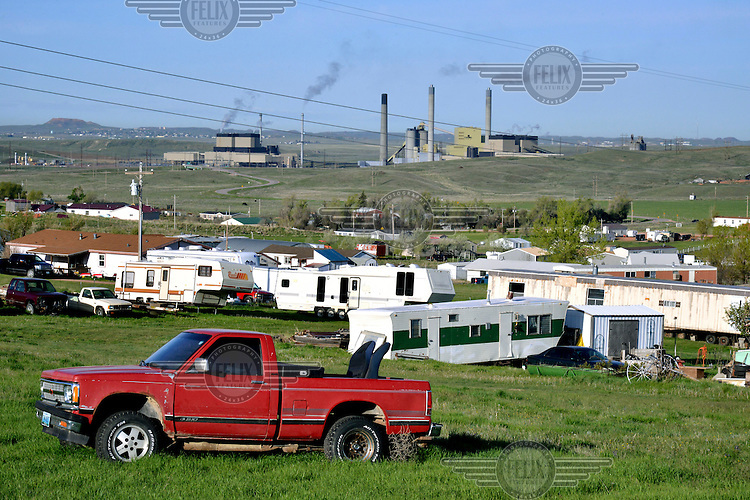 Trailer homes with Wyodak coal power station in the background. Vast swathes of America's untouched west are being eaten up by development, especially logging and mining and the associated infrastructure, roads and urban growth. Wyoming is the most-affected state, according to a study by the Center for American Progress (CAP). In the decade preceeding 2011 4,300 square miles of Wyoming's wilderness disappeared. The town of Gillette is at the heart of this landscape transformation having grown, alongside the expanding coal industry, from a rural backwater to a town of 31,000. Restrictions: Not available in Austria, Germany or Switzerland.